Quite often, the word condo suggests either glorified apartments with, perhaps, a few extra amenities or large oceanfront buildings designed to be second or vacation homes. Increasingly, however, developers are creating vibrant living spaces in older buildings that once housed schools, factories and Army barracks and renovating once-dormant storage space above storefronts in urban shopping areas. Not surprisingly, this form of real estate reincarnation is common in the historic sections of Savannah, Charleston and Wilmington. Steeped in history and in the shadow of the Sullivan-s Island lighthouse is an address that leads coastal living in a new direction. Most of the island consists of beach houses, old and new, large and small, but condos here are a rare commodity. The Officers- Quarters is a collection of six exquisite condos carefully carved from what was once the Army-s bachelor officers- quarters. 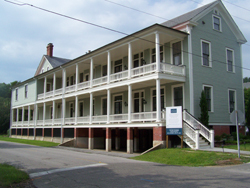 Built on the grounds of Fort Moultrie in the early days of the 20th century, the quarters included spacious porches to catch the ubiquitous sea breezes, large windows, pressed metal ceilings and a central staircase. Heart pine floors and fireplaces and intricate details befitting officers were the order of the day, and all have been lovingly preserved and are part of the new layout. The smallest unit at The Officers- Quarters, just under 1,000 square feet, is situated on the main floor, while the largest offers four floors of luxury living and comes in at nearly 4,000 square feet. Price tags range from $895,000 to more than $2 million. These one-of-a-kind residences, which preserved as much as possible from the original building, include original and new hardwood floors, refurbished historic windows, original staircases and, in two of the units, tin ceilings. Modern conveniences such as granite and marble countertops, gas fireplaces and built-in cabinets blend seamlessly with the original bits of history. High-end appliances and modern plumbing simply add to the perfection of these homes. Owners will have more than a lovely island home nestled among the shade trees that line the island. A common area includes a pool surrounded by teak furniture and a nearby wet bar, while gas lamps at the entries, personal storage areas and ample parking are among the extras. In 1881, the building known as The Cigar Factory actually was a modern cotton manufacturing plant. Though the plant achieved great success, it was already out of business by the time Charleston was shaken by the great earthquake of 1886. The building sat idle until the American Cigar Company leased the property to produce RoiTan and Certified Creamo Cigars. The factory boasted 1,400 employees in its heyday and cigars rolled off its assembly line for some 70 years. After the smoke cleared, the building was used for offices and, in 1980, became the home of Johnson & Wales University until the school moved to Charlotte, North Carolina, in 2006. The Simpson Corporation purchased the building a year later with a view toward bringing it back to life with a mixed-use complex of condominiums, offices and retail space. "What separates us from the rest are the spectacular amenities such as a walled Charleston garden, wine cellar and tasting room, fitness center and screening room and an observation deck," says on-site Sales Manager Clint Kelly. And that-s just for starters. The condominium building itself will offer 15-foot ceilings, hardwood floors, brick walls, 8-foot-wide halls and on-site parking, a rare commodity in downtown Charleston. When complete, there will be 66 units, most in the 1,000-to-1,500-square-foot range, but a few homes will be a little less than 800 square feet. Regardless of size, they will be unlike others in the Charleston area, with high ceilings and industrial windows that enhance views of the nearby Cooper River and Arthur Ravenel Bridge. 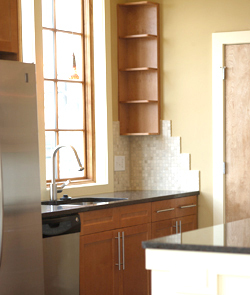 Sliding glass walls invite versatility, and the kitchens and bathrooms will be top-of-the-line. Office space is available, as is about 40,000 square feet of prime retail space. 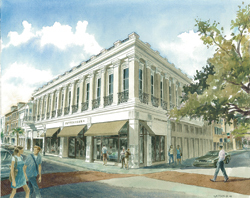 Not only will The Cigar Factory be among Charleston-s most desirable addresses, but the area also will be a premier shopping destination. "Our location is so good," Kelly says. "We-re close to everything." It-s easy to be dazzled by the storefronts that line King Street in downtown Charleston-s main shopping area, but if you allow your eyes to wander upward, you-ll see that there is an upstairs to most of these architecturally interesting buildings. Although some are nothing more than storage space and others are apartments rented to college students, many of these second stories are starting a second life as upscale lofts. In contrast to The Cigar Factory lofts, no retailers need to be courted since shops such as Pottery Barn are already in place. 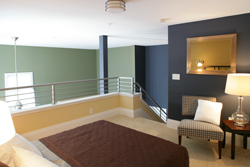 Just upstairs are the Davidson Lofts, seven exclusive units designed to make the most of downtown living. The smallest - a spacious 1,500 square feet - is selling for just under $1 million, and the asking price for the largest is a bit more than $2 million. 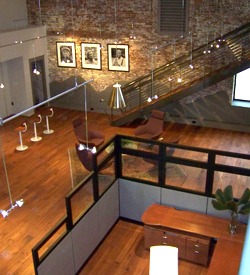 The Davidson Lofts are a brilliant blend of airy loft-style space and the charm of Charleston history. Each open floor plan includes a large, modern kitchen with the latest in appliances and either traditional or European-style cabinetry. Bathrooms are fittingly elegant, and high-quality materials are incorporated throughout each residence, including natural stone and marble, wide-plank flooring and smooth stained concrete against a backdrop of the original exposed brick. The original iron-framed windows, some of which are 12 feet tall, were preserved and allow the light to stream inside. Even more interesting is that each unit has a rooftop terrace, offering exquisite Lowcountry views of the College of Charleston, King Street, the Arthur Ravenel Bridge and more. Wilmington-s downtown is waking up to a new day. Situated on the Cape Fear River, Wilmington-s historic district has long attracted visitors and locals who enjoy the fine dining and shops that line the area. But a new area of Wilmington has been reborn and is already vibrant with a new vitality. At one time nothing more than empty, overgrown lots, this part of town is now known as the Brooklyn Arts District, although it might just as well be called the Loft District, thanks to a host of new urban residences that dot the once loathsome landscape. "This part of town used to be the retail district, but during the Depression everything came to a halt," says Jason Smith of Laney Real Estate. "It was the unused part of downtown, but it-s been renewed during the last eight years." The Modern Baking Company offers 24 lofts and condos with a contemporary industrial feel. Although it is new construction, it is next door to the former bakery, and was built to look like a converted warehouse, according to Smith. One- and two-bedroom units offer extras such as built-in bookshelves, covered balconies and thoughtful layouts designed to appeal to young professionals. A variety of design choices, whimsically called The Artist, The Executive and The Philosopher, allow each owner to customize his or her space. Parking is nearby, as is the Cape Fear River and the busy night life, just minutes away in the historic district. Over the next few years, it is anticipated that this area will continue to grow and include a new convention center, a river boardwalk, two marina condo projects and several more residential buildings. "When the amenities are in place, the people will come," Madonna McMahon, an agent with ReMAX Coastal Properties, says, referring to the businesses that have opened in the area. "There is a personal trainer, a coffee shop and a florist. There is so much growth." In the same area as The Modern Baking Company is another loft development with a decidedly different flair. Also constructed by Plantation Builders, The Weldon brings back the Art Deco era with a modern bent. The blue neon backlighting the building-s name is just the beginning. Bamboo hardwoods give an edgy look to living areas accented by black-on-black appliances, deco trim, contemporary cabinets and chic, understated lighting. "The Weldon used to be a furniture store, and the building is named for the railroad track from Wilmington to Weldon," McMahon says. "It was the longest track at the time (mid-1830s)." Each unit at The Weldon features two paint colors, lever-style door handles and ceiling fans. Most also include a separate study and storage areas. The flats offer high 10-foot ceilings, and the lofts have soaring 20-foot ceilings. Another property with a history is Bannerman Station, named for Judge William Tate Bannerman. Once residential, the homes on the site were razed to make way for an Art Moderne-style bus terminal. Today, Bannerman Station is an opulent residential building reminiscent of New York City. "The condos are all breathtaking," says McMahon. "The building is modeled after a place on Park Avenue, and it is very luxurious." After a half century of educating Savannah-s young students, the Charles Herty School closed in June 1992. Today, the Herty Lofts are home to young professionals who love the ease of condominium living just two miles from downtown Savannah. Situated in a quiet neighborhood, the Herty Lofts are modern one- and two-bedroom units featuring large open windows that look out on lovely landscaping. Inside, glass walls add to the hip look, while in the corridors, old-fashioned porcelain water fountains still line the walls. Part of the goal in the conversion of the Herty School was to maintain the integrity of the structure, including the wide hallways that once held jostling children, while creating condos that would appeal to young professionals. Inman Park Properties developed the project, and plans call for an additional building of 36 lofts to be constructed on a three-acre site. A pool and cabana area will be shared by owners in both buildings. Dr. Charles Herty might be surprised to see the latest incarnation of the school named for him, but no doubt he would be among those applauding the transformation from classrooms to class act. For those who need to be at the center of everything, Broughton Street in Savannah is an up-and-coming residential area. With several condo developments along this street, there is truly something for everyone. The Lofts on Broughton (addresses range from 310 to 322 West Broughton) include a variety of one- or three-bedroom floor plans. 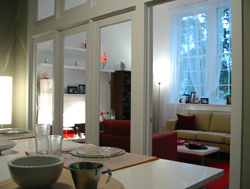 They are modern, sleek and a sharp contrast to the city of Savannah, but the blend of old and new works well. 310 Broughton offers three plans - two one-bedroom units and one three-bedroom - in a choice of three finishes. Prices range from the mid-$250s to the low-$400s. The downtown location is just a few blocks from the Savannah River, with its endless parade of water traffic and shops and eateries on the riverfront. More upscale shopping is even closer, as are nightspots such as Jazz-d, where light bites are served against a background of live jazz. And, because it is downtown Savannah, history lurks around every corner and parks invite you to sit for a spell. Cora Bett Thomas Realty and Associates, no strangers to unique properties, are marketing the Herty Lofts and The Lofts on Broughton. In a world where many things, including homes, seem disposable, it is heartening to see developers create new uses for old buildings.